I had long been wanting to visit Chicago but the stars had never seemed to aligned properly between getting time off and avoiding the cold blustery or sticky hot months. Finally, a few weeks ago, thanks to the overwhelming generosity of an old friend, I was finally heading to the Windy City. At my friend’s prompting, I decided to take the money I would have spent on lodging and basically go crazy with my dining options, of which Chicago boasts plenty. I had soon lined up a murderer’s row of choices, starting with my first stop right after I got off the plane at O’Haire – Moto. 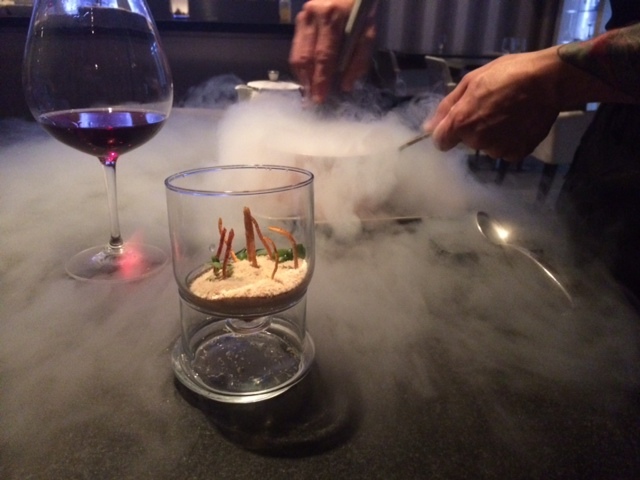 As it turned out, the restaurant, known for its clever mix of molecular gastronomy and classic preparations, was in the midst of celebrating its 10 year anniversary. 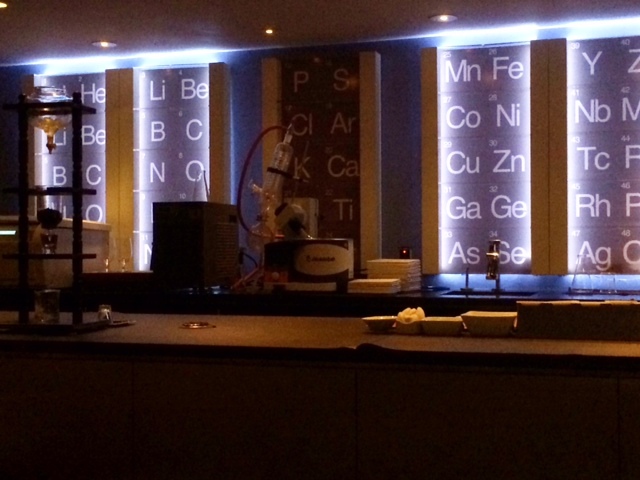 As part of the festivities, they had a special 8 course tasting menu server downstairs in the Lab, which is where they develop new techniques and have a small seating area for guests. I had made my way to Moto after taking the blue line metra from the airport and then walking about a half mile (including over a bridge) in a fairly industrial part of town with my suitcase. While that probably wasn’t the wisest of ideas, my temporary exhaustion melted away in the cool, pristine Lab room. There was no menu as they wanted to keep things a surprise but the executive chef Ritchie explained that it would be a mix of new dishes and several Moto classics. The first course was a buffalo tartare with several micro greens picked from the their in-house grow room and crispy shallot strings. 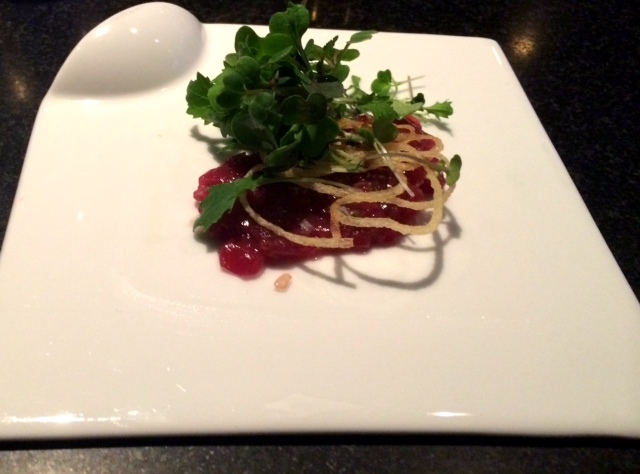 It was a fairly classic tartare, never a favorite of mine, although the dense buffalo meat made it have a bit more texture than a typical steak tartare. This was soon followed by a truly spectacular presentation – Flavors of the Sea. In the center was a huge, perfectly cooked diver’s scallop. This was surrounded by four different types of seaweed, some pickled, some crisped. It was a really stunning dish and made me excited to see what was next. Richie presented this course personally, calling it “Chicken Wings” The wings had been sous-vided for 48 hours and then the bones removed. 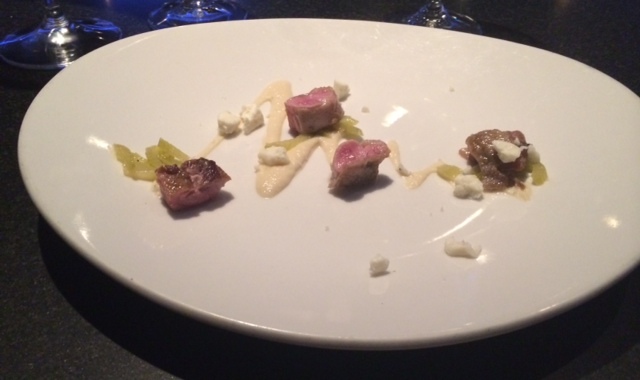 There was a blue cheese emulsion and tiny braised celery. The chicken was very moist and mixing the other components made it very much taste like a traditional wings and dip dish. Next up was “Breakfast Radish”, Richie’s play on the classic French side of radish and butter. In this case, the radishes were sliced into ribbons and the butter was turned into a powder. Similar to the chicken wings, once you combined the elements, it tasted like its much more simpler version. Delicious. Inside was a skewer of roasted potato and lamb belly, which had been slow cooked for days and then quickly grilled on the plancha to crisp it up. 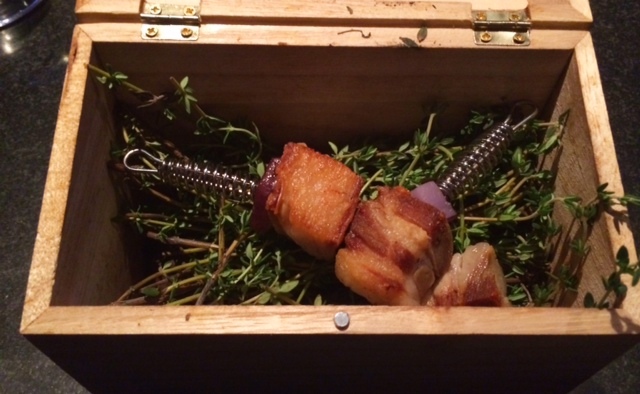 The metal coils on either side kept the skewers warm and heated up the thyme and rosemary to impart those smells. I had never had lamb belly and found it to be very tasty, especially with the crisp potatoes adding a nice crunchy element. By this point I was starting to feel a bit full and asked for a breather. This turned out to be a good call as the last savory dish, while small, was incredibly rich. Called “sus scrofa” it was slow cooked wild boar surrounded by a Mexican mole sauce which had been turned into a powder. The boar was dense with flavor and very tender. The powdered mole liquified as I scooped up the hot boar meat, turning into a very rich and delicious sauce. Having grown up in Texas, these flavors were very familiar to me, albeit in a much different presentation. Richie laughed as he saw my reaction to the first dessert. 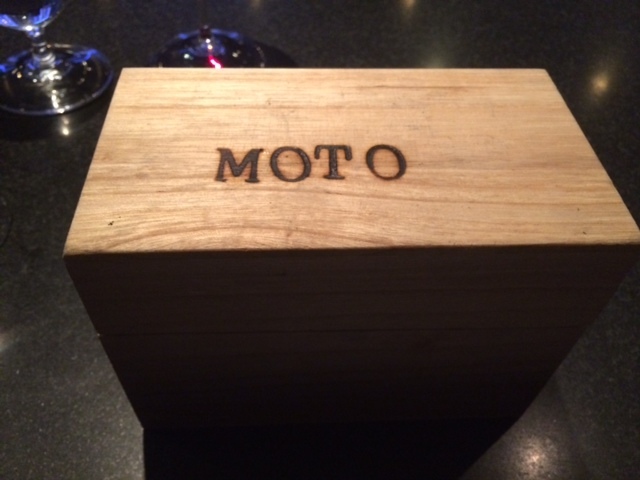 I had read about Moto’s creative approach to sweets but this even exceeded my expectations. Called “hot dog” I was told to eat it like I would a typical hot dog. 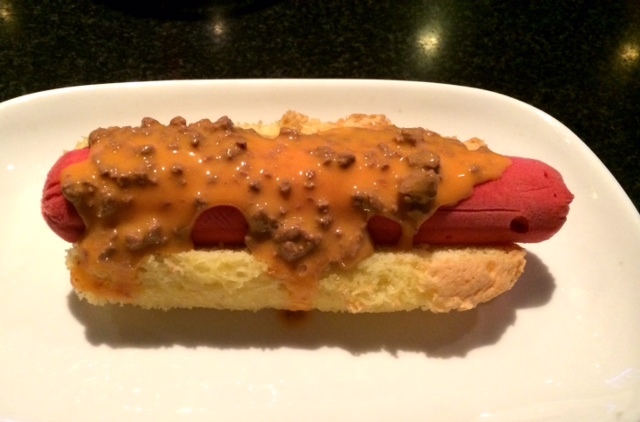 However, it was, of course, not really a chili cheese dog. In fact, the hot dog was a raspberry sorbet. The cheese was a very flavorful orange sauce, with the chili bits actually coca nibs. Finally, the bun was angel’s food cake to complete the illusion. Eaten together, it was like having an ice cream cake made with sorbet – incredibly clever and very tasty. 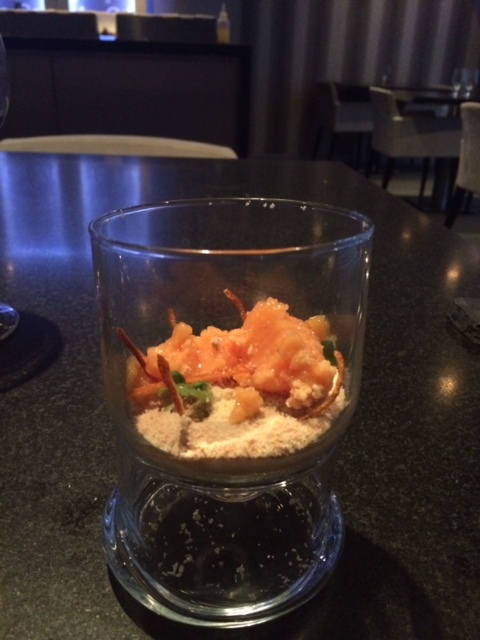 Richie came out for the final course to make a blood orange sorbet table side using liquid nitrogen. He explained that using this method allows him to create the sorbet in 30 seconds plus it looked cool, of course. My table turned into a mass of foggy air as he quickly whisked the mixture. 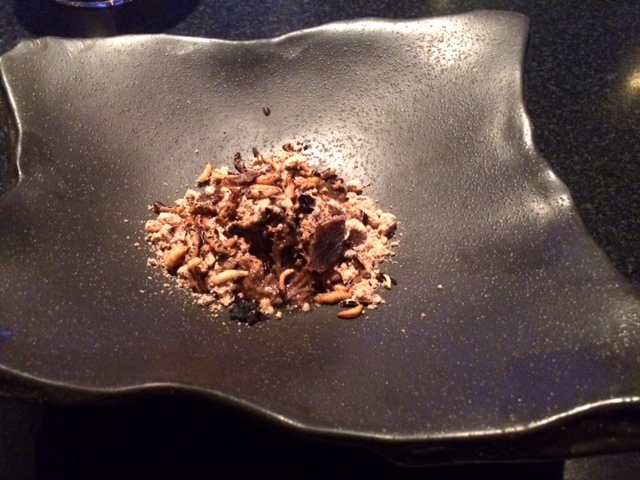 This was to go on top of the chocolate mousse, which was both a powdered mouse and a creamy liquid. While I’m not the biggest chocolate mousse fan, this was a very nice take on it, especially with the theatrical elements at the beginning. After I finished, I was given a tour of their grow room, where they cultivate various micro greens, as well as the kitchen where I met the staff. They only have 7 cooks and 1 dishwasher for what on a full night can equate to over 1600 individual dishes – very impressive. I was left with an impression of a very smart, very hardworking team that loves what they do and how to keep pushing themselves. A great night. Posted on June 17, 2014 by reyalto. Bookmark the permalink.